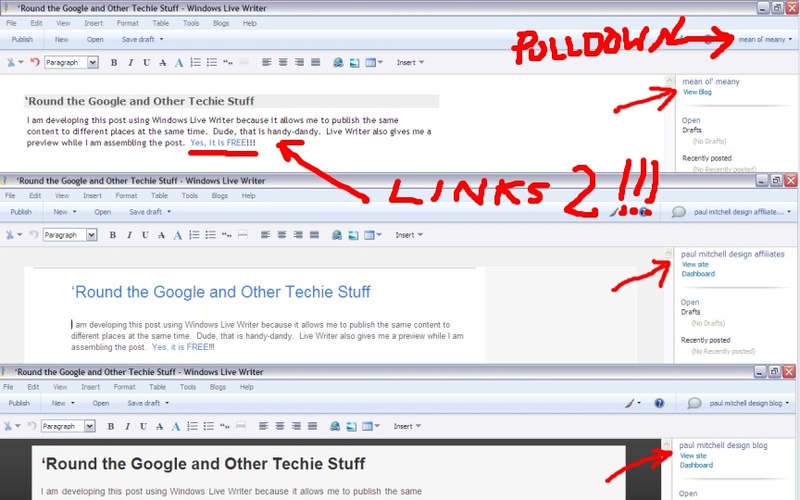 I am developing this post using Windows Live Writer because it allows me to publish the same content to different places at the same time. Dude, that is handy-dandy. Live Writer also gives me a preview while I am assembling the post. Yes, it is FREE!!! The only problem that I have found is that images do not insert like I would prefer. But, it does upload those images to the proper place automatically, which is a plus. That is if you use the default storage from your platform, which I do not. And, if you like adding the Zemanta Links or something else at the bottom of a post, Live Writer doesn't do that, either. But, you can upload as a draft and add those things before you go all publishy and stuff. Let's just say, having used this for about a week or so, it is more than worth the price (FREE!!!) and it allows you to see your posts in three different views before posting, edit, preview, and source. The html is a little heavy in Live Writer, but that happens on Blogger in "Compose" mode, too. If you are just a Nazi for minimizing the size of your post code, you can always go back and delete those four characters for the double space. Yes, I do. UPDATE: Andraž from Zemanta left a comment correcting me on my comment about Live Writer not supporting Zemanta content and links. It does and it looks just like the interface with Blogger and Wordpress. Dude, they got it going on and to drop by a little blog like mine and leave a comment shows a level of customer service that we have not known since the Co-op stopped shelling walnuts. Here is the Zemanta Plug-In for Live Writer. Like the kids say, "It is Da Bomb." I am thinking that at some point, Google Docs will develop a blog publisher because of the extensive clipboard stuff they got going on. How about writing campaign speeches using Docs? Docs also allows you to use the service to collaborate. Here is a story on how some doctor-people did just that. Teh Google Docs is also adding Fusion Tables. I have completely rid myself of Microsoft Office and have only been using OpenOffice for about two years. I think that within the year, I'll be rid of OpenOffice, too. And why has Mozilla not produced something like that? It seems just tailor made for a plug-in. Oh, you can check to see if your Firefox Plug-Ins are up to date, here. Here's an update on that whole privacy thing that Teh Google got into with Buzz. They settled. G-Mail has released five new themes. The Droid one is pretty cool, but I shall still stick with "Shiny." It doesn't hurt my eyes. just so you know, a dark background with white writing makes my brain bleed. It seems that You Tube only has one billion subscription subscribers. You would think with so many people using the service DAILY, there would be ten times that many. Teh Google Instant rolled out to MO-BILE yestiddy. Funny, I had been using it on my Droid X since I got the phone. Why use MO-BILE web when you can use REAL web on your over four inch screen? 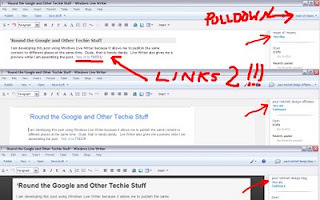 AdSense is ramping up the tutorials on their blog. I had a conversation with another blogger last night about the "Make Money Online" business gurus. While I have gleaned much information from some of those guys, mainly my information on traffic and links comes from the source of most search engine traffic. Seems like Teh Google would be the best source for how Teh Google picks WINNAHS, huh? I subscribe to THIRTEEN Teh Google blog thingies. That is nuts, and it is not all that they have, either. By the way, if you are a Po-lock, Adsense has a service for you, too. As a matter of fact, here is an actual Teh Google Sites webinar on Steegle. The format is a great design and works well. If you just want a recap of the webinar, here it is on Teh Docs Blog. As long as we are doing a tech post, Teh Twittah has got new graphics to go along with their new HUGEJASS heavy coded new format. But, instead of using Twittah's format, why not just use the Wibiya toolbar at the bottom of this 'chere blog, yo? Seriously, Twittah should have thought twice about that new format. By the way, if you read e-books, here is a FREE! site that has bunches of them. And guess what? All you deadbeat writers that could upload your war tales, your cooking secrets, and whatnot, you should do that at the site I linked. Don't cost nothing and maybe you could get someone interested enough to grow your information products business. You know, maybe publishing math worksheets or poetry even. Naw, you'll never do that, it might be really profitable and get your name up in lights or something. Please take the time to comment, to try out the Wibiya toolbar, and make me a damned sammich! Dang, I need that Andraz, thanks a bunch! !